When I look at my grandmother, I find myself frightened by our likeness and how we have bonded through a shared feeling of brokenness. My grandmother has suffered greatly from a broken heart and a deep betrayal that scorned her more than 40 years ago. Like me, she lives alone and stuck within the confines of her mind for company. As long as I can remember, she has always had a full glass of wine nearby and I find it to be a painful reminder of my family lineage and the significant role that alcohol has played in healing the wounds you cannot see but the ones you always feel. Sometimes, my father becomes frustrated with her inability to “move on,” but I understand how it feels to be broken and trapped in a life of solitude. I understand the pain in your stomach from confronting a lost and familiar face. As my grandmother has aged, I’ve watched her slowly deteriorate mentally and physically, further removed from reality and closer to being part of the earth. I wonder if I will fall the way she has or if I can figure out how to be the person to pick myself back up. I took this photograph of my grandmother on Christmas morning – my quiet tears obscured the viewfinder and made it difficult to focus. 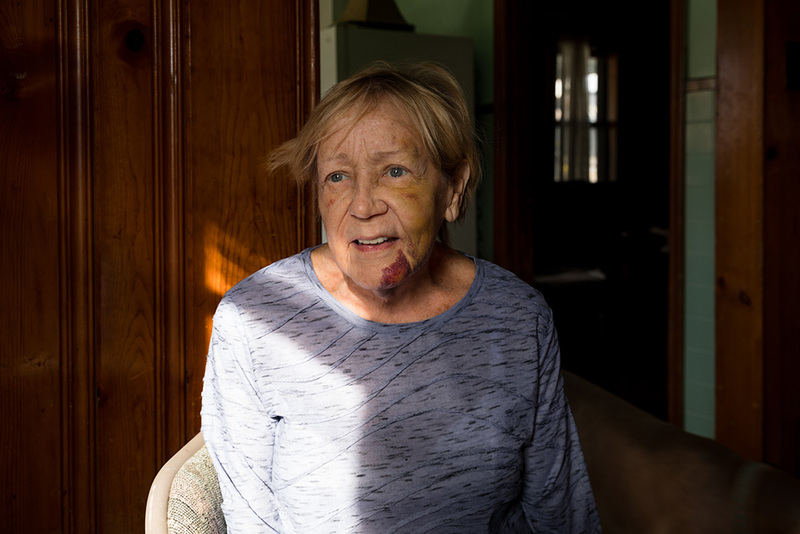 With every new bruise my grandmother accumulates, I am reminded that some things never heal.